Our nanodelivery systems greatly enhance drug delivery and efficacy and allow us to modulate drug targets with peptide, protein and small molecule therapies. We utilize a highly effective drug delivery system based on a well-described nanopolymer with over 30 years of safe human use. This system rapidly self-assembles with both small and large molecules (e.g. proteins, peptides and nucleic acids) and “packages” them into nanoparticles. These nanoparticles greatly enhance cellular delivery into both mammalian and bacterial cells. Use of this technology allows Blueberry to develop therapies against well-validated targets in new ways. It also lets us over-come the limitations of some current therapies by improving drug solubility, cellular delivery and efficacy. Finally, the ability of our nanopolymer system to deliver protein and peptides in active confirmations into cells opens up exciting new possibilities for “intracellular biologics” capable of tackling attractive approaches to disease treatment that are currently perceived to be “undruggable” by conventional small molecule treatments. 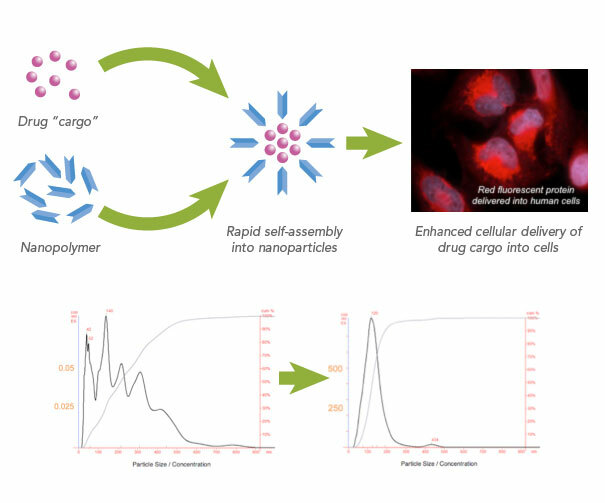 Figure Legend: Rapid assembly of nanoparticles containing cargo molecules. These nanoparticles greatly enhance the cellular delivery of these molecules into both mammalian and bacterial cells.